PLANE: There are three airports which are suitable for Waterford. Waterford City has its own regional airport with regular daily flights by Aer Arann www.aerarann.com from Birmingham, London Luton and Manchester. In previous years Aer Arann ran a summer service from Lorient in Brittany, and from Amsterdam, however the timetable for 2010 is not available yet. We will arrange pick up for any performers flying into Waterford. Car Hire is also available at the airport. Cork Airport is approximately a 2 hour drive from Waterford. It is serviced by a number of airlines. Jet2.com: www.jet2.com Friday and Sunday from Newcastle. If you intend to fly into Cork Airport please contact us and we may be in a position to arrange transport to Waterford. Dublin Airport is approximately a 3 hour drive from Waterford. It is serviced by over 20 international airlines including . There is a shuttle bus service to main bus and rail stations in Dublin. • Bus Eireann operate an hourly bus service (www.buseireann.ie) between Dublin and Waterford. If you intend to fly into Dublin Airport please contact us and we may be in a position to arrange transport to Waterford. 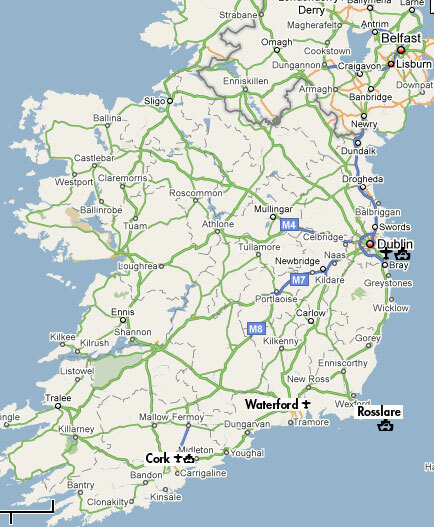 The closest ferryport to Waterford is Rosslare which is a 1 hour drive from Waterford. It has daily ferry services from Fishguard and Pembroke: Also a summer crossing with Cherbourg and Roscoff. Dublin Ferry Port and Dun Laoghaire (outside Dublin), a 3 hour drive from Waterford, also have daily ferries from Liverpool and Holyhead. A new ferry service between Swansea and Cork begins on March 1st. Cork is 2 hours from Waterford (130 kilometres). We have special group rates arranged with some of the ferry companies so if you intend to travel by car ferry, please contact us before making a booking. We can then advise of a special booking code which may attract a 20-25% reduction.